Outdoor lovers will be in their element on this tour through some of South America's most outstanding landscapes. Chile is a land of extremes, showcasing barren desert moonscapes, dramatic granite spires and verdant farmland peppered with emerald lakes. You can't fail to be wowed by this country's seriously impressive scenery. Joining the trip in Santiago today, our intention this afternoon is to take an orientation tour of the city by bus. One of the most scenic cities in South America, Santiago lies in the shadow of the Andes and the old part of the city, around the Alameda, contains a number of fine buildings, statues and gardens, including the impressive Presidential Palace and the monastery of San Francisco. The city is filled with museums to its colonial and pre-Columbian past and in the Bellavista district we can find the unusual house of the famous Chilean poet and Nobel Prize winner Pablo Neruda. Today has been left free to explore some more of the city, to wander its streets and parks, or to taste the regional food and drink some of the famous Chilean wine. Alternatively there is the option of a trip to the nearby city of Valparaiso, Chile's culture capital. Once a colonial port linking trade with neighbouring Peru, the city suffered numerous raids at the hands of pirates, including Sir Francis Drake. Reaching the height of its prosperity during the 19th century it finally fell into decline with the onset of the steam age and the opening of the Panama Canal. Much of its colonial past has been destroyed by a number of powerful earthquakes over the years, but the city still retains some of the grandeur of its past. Today it is a major port and the surrounding hills, a natural amphitheatre covered in colourful houses and mansions, are a UNESCO World Heritage Site. Flying to Calama this morning we transfer by private bus to the oasis town of San Pedro de Atacama, set high among the spectacular volcanoes of Los Andes Cordillera and our gateway to the dramatic landscapes of the Atacama Desert. On arrival there will be time to relax, and this afternoon we will take a walk among the dunes of the nearby Valle de la Luna (Moon Valley), a nature reserve to the west of the town, where the surreal landscape has been formed by the erosion of the salt mountains. We intend to watch the setting sun cast its golden glow across the spectacular landscape, before returning by bus back to San Pedro. San Pedro was once the centre of the Atacama culture, before the arrival of the Spanish, and its dusty streets and evocative setting still exude an air of times long past. Over the next two days we have the chance to explore in more depth the cultural and natural diversity of this town. Our first day sees us travelling out to the gigantic Salar de Atacama to walk on the salt flats, undoubtedly one of the most dramatic natural features in the country. The barren valley of salt has been almost moulded by wind into crystalline forms on its crust - some hexagonal and others almost coral-like, or like shards of ice. Flamingoes drink from the saltwater lagoons, a flash of bright pink against the otherwise barren landscape. As well as walking in this strange setting, we visit the small village of Tocanao, known for its buildings made of the volcanic stone liparite. We visit the church and historic bell tower, as well as the booths of craftspeople who sell their wares in the small village square. Our second day in San Pedro has been left free, affording the chance to do some exploring on your own. You may like to take an early morning trip out to the El Tatio Hot Springs, a geothermal field of spouting geysers and steaming fumaroles surrounded by a vista of volcanic mountains. Watching these active geysers erupting in the light of the rising sun is an impressive sight. Today we fly to Puerto Montt, the most important port in the south of Chile and, in a very real sense, the spot where the developed or settled population of Chile comes to a full stop. This is the gateway to the wild and rugged regions to the south and from here we drive to Puerto Varas and our hotel, based beside the shores of Lake Llanquihue. With some free time to explore we'll take a stroll on the lake shore, the second largest in Chile and one of the shimmering jewels of Chile's Lake District. Set against the backdrop of snow-capped volcanoes, this is the third largest expanse of natural water on the South American continent and presents us with a quite breathtaking setting. We have a full day of short hikes in this area, which is dominated by the classic volcanic cone of Osorno (2680m), an almost picture-perfect representation of a snowy volvanic peak. Our walk takes us through the lush landscapes of the Valdivian rainforest, the slopes of the mountain sprinkled with Andean birch, providing a haven for chingue (Patagonian skunk), culpeo (Patagonian fox), weasels and puma, whilst the bird populations boast hummingbirds, woodpeckers and kestrel. We head to the Petrohue Waterfalls, a cascading torrent of emerald-blue with a stunning backdrop of the Osorno Volcano. We fly to Punta Arenas today - our journey is normally in the afternoon but flight schedules can change. On arrival into Punta Arenas we take a public bus for the three hour drive to our hotel in Puerto Natales. This is the gateway to the Torres del Paine national park, and from small beginnings as a tiny fishing port it has now blossomed to a hub of adventure, with an atmosphere of excitement as travellers pass through on their way to the mountains. From the edge of the town there are striking views out to the fjords, and looking back inland we see the mountains rising imposingly over us. We will arrive in the evening to Puerto Natales. Leaving Puerto Natales this morning we travel via the Milodon Cave to Torres del Paine National Park, arguably one of the world's most beautiful national parks, described by Alberto de Agostini as 'one of the most spectacular sights that the human imagination can conceive'. We spend the full day in the park and drive around the circuit with plenty of stops to take in the wild and rugged scenery. Torres del Paine is situated amidst a region of ice-capped peaks, silent blue glacial lakes and wild hill country. It is not unusual to see large numbers of guanacos here, as well as black-necked swans, upland geese, pink flamingos and the odd grey fox snooping around the human food areas looking for an easy meal. We may even be fortunate enough to spot condors. One of the highlights of our time here will be the views of the Torres, imposing pinnacles of sharp granite that are surrounded by glacial lakes and craggy ranges, formed millions of years ago. Reaching over 2600 metres these towers are just part of an impressive range, the highest of which is the Cerro Paine Grande, presenting us with one of the most breathtaking mountain vistas on the planet. This is a place to keep an eye out for condors, rheas and guanacos. The itinerary here is kept flexible so we can make the best choices depending on weather conditions as some walks and stops may not be possible due to high winds. Today we have the opportunity to explore this wilderness on foot. We start out on the Hunters Trail, a roughly 7.5km hike which takes 3 hours to complete. The trail crosses natural habitats of big guanaco colonies, and for the lucky few there is the chance to spot the elusive puma. Otherwise, its a great hike for seeing condors or the black-chested buzzard eagle, as well as going past the remains of cave paintings made some 6000 years ago, by the remote and primitave Aonikenk tribes of Patagonia. In the afternoon, we walk to the magnificent icebergs of the glacier-fed Lago Grey, an easy 5km hike of about 1hr in length. The scenery is magnificent throughout, and again the itinerary is flexible in case of the strong winds that sometimes whip through this wild landscape. For those who particularly wish to do the area's most iconic hike to the base of the Torres peaks, it can be undertaken with a local guide from the lodge, at an additional cost. We have our last morning in the park before departing for Puerto Natales in the early afternoon. It's a short drive, or alternatively for those who wish there is the option to take a zodiac boat from Torres del Paine. This excursion starts with a zodiac ride down the Serrano River for one and a half hours, reaching Puerto Toro where we will hike for 30 minutes to get up-close to the Serrano Glacier. After our hike we then board a larger vessel and continue our journey south for another one and a half hours arriving for a well-deserved barbecue lunch at a traditional estancia. We come back together in Puerto Natales in the evening, and have the rest of the day free to relax or perhaps eat out at one of the town's many restaurants. This morning we transfer to Punta Arenas, from where we fly back this afternoon to Santiago. On arrival we will transfer to our hotel for the final evening of our journey through this remarkable country. The trip ends in Santiago after breakfast. Comfortable walking bootshoes or trainers, and sandals. Binoculars, torch, water bottle, insect repellent, sun cream (at least factor 15), a dry bag (for keeping things dry inside your daysack if it rains on walks), good quality sunglasses and a lip salve with sun protection and walking poles (if you use them). You should allow US$60 for tipping. All passengers arriving with passports from Australia, Canada or the USA will have to pay a 'reciprocity tax' before getting into the imigration area. Australia US$61, Canada US$132, USA US$131. Citizens of Australia, Canada and the US will have to pay a 'reciprocity tax' to be paid on arrival before arriving into immigration. This currently costs 61USD for Australian citizens, 1532USD for Canadian citizens, 131USD for US citizens. Parts of this trip are undertaken at a high altitude - the realm of thin, cold, dry air. Whilst this is unlikely to be a problem it is wise to be aware of how it may affect you. Why not extend your trip with 4 days on the mysterious Easter Island. 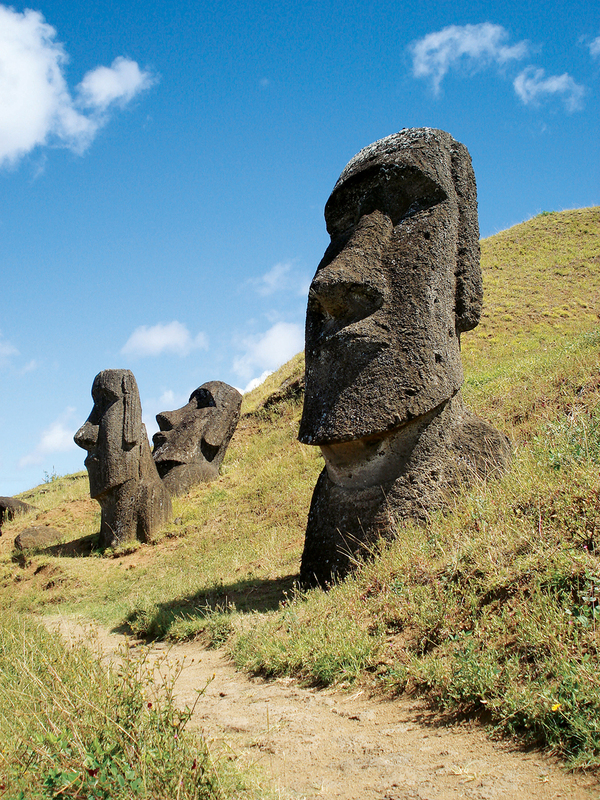 Explore the magnificent stone heads, or Moai, that stand sentinal across the rugged coastline. Click here for more details.